Posted in red devils with tags lester butler, Mick Jagger, red devils, rick rubin on May 22, 2011 by J.J. 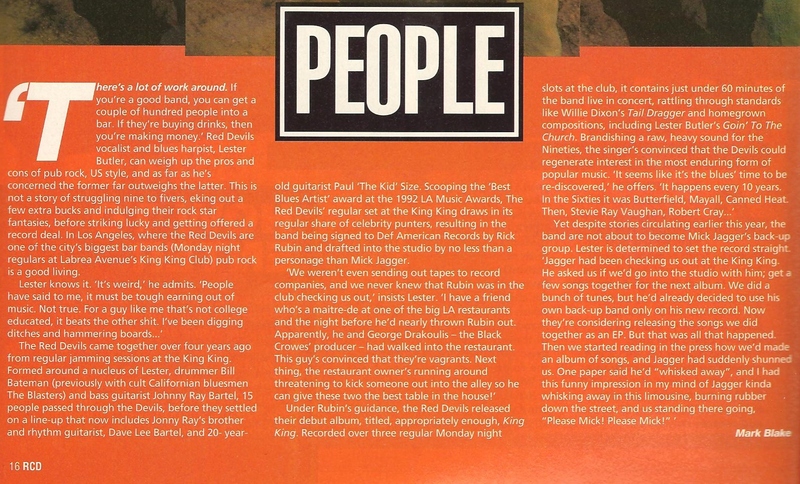 Thanks to Paul Brown of the UK for this clip from the May 1993 edition of Rock Compact Disc Magazine. Interesting for Lester Butler’s pulling back on the Mick Jagger stories by this point and laughing off the image of Jagger being “whisked away” from the Devils after the session. Posted in Uncategorized on May 18, 2011 by J.J.
Nofightin.com will be attending the Lester Butler Tribute Band gig at the 22nd Annual Simi Valley Cajun Festival in Simi Valley, Calif., Memorial Day weekend, May 28 and 29. Also performing that weekend are Los Fabulocos with Kid Ramos, the Mannish Boys, Elvin Bishop, Kirk Fletcher, John Nemeth and a whole lot more. We’ll be out there live, mostly shooting pictures and posting updates and more @nofightin on Twitter. NO FIGHTIN’: The original, the main site — you’re on it now. Deep reviews, news and history on the bands. TWITTER: We post there often, with links back to nofightin.com and other links and news we find interesting. It’s not always Red Devils, but always something good. Follow @nofightin. YOUTUBE: Posting rare videos there, as well as making playlists so you don’t have to search all over for vids. TUMBLR: Just added ourselves to the blog site, where we’re posting random photos, videos and more. Follow nofightin.tumblr.com. And if you really love us, shop in the No Fightin’ store! Posted in 13 with tags 13, alex schultz, eddie clark, lester butler on May 9, 2011 by J.J.
We’ve been going through thousands of photos, videos, posters, documents and ephemera given to No Fightin’ by drummer Eddie Clark. Much of it focuses on his time with 13 or his many years with William Clarke. Over the coming months, we’ll be posting more rare inventory from the Eddie Clark collection. 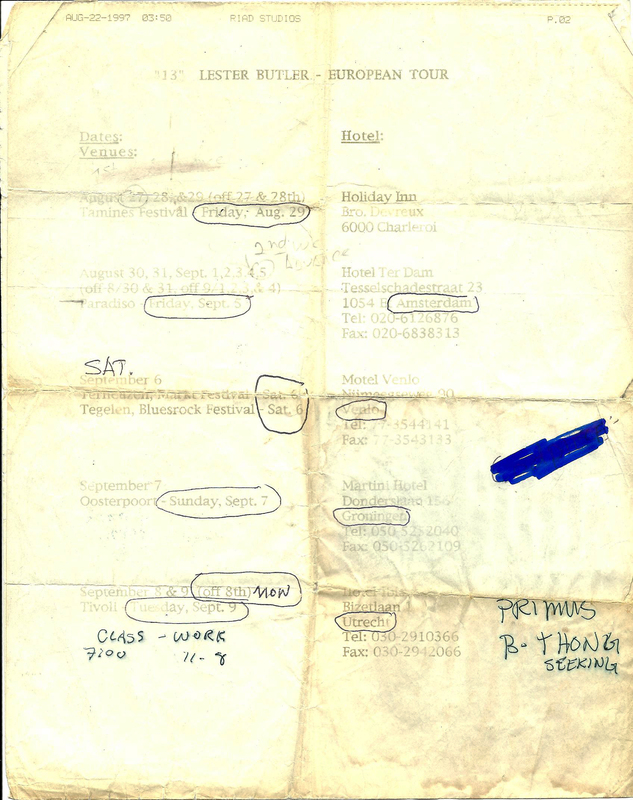 First up: This faxed itinerary for 13’s 1997 European tour, which came in one long sheet, like a blues scroll. 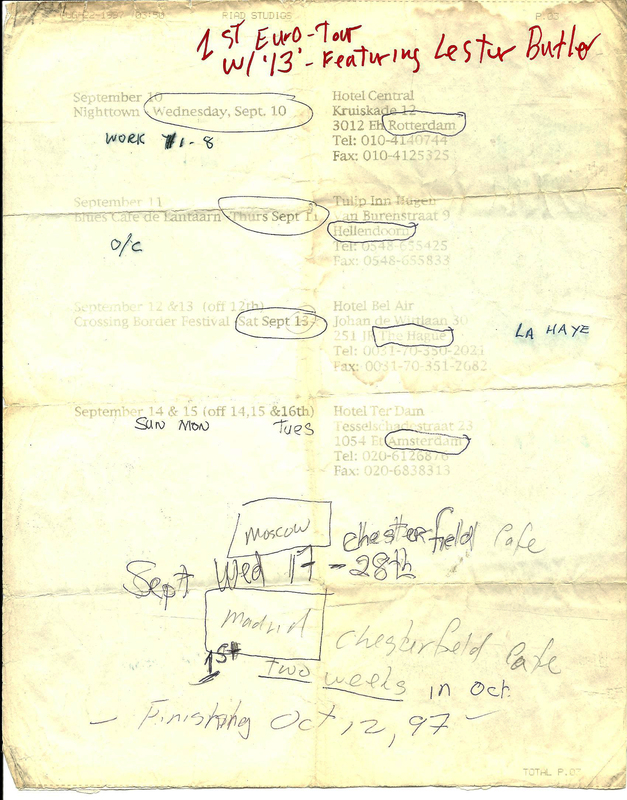 Plenty of notes in the margins, including the addition of several days at two separate Chesterfield Cafe clubs, in Moscow and Madrid. It offers a little different look at life on the road for a touring musician. Most of these dates are already in our timeline, and we’ve corrected others based on this first-hand information. Follow @nofightin on Twitter as we give updates on our work on the Eddie Clark collection. You are currently browsing the No Fightin': The Red Devils, Lester Butler & California blues, rock and roots music blog archives for May, 2011.